We continue to take every opportunity to find out something new, improve our expertise and go deeper into already familiar topics. From time to time, we invite guests to our office and ask them to talk about something useful, to give us a training course or a seminar. What a better reward a company can offer to the employees than an extraordinary birthday party on a sunny autumn day? A translators’ powwow organized by ProZ.com took place in Dnipro on June 16, 2018. The gathering started with a walk along the longest embankment in Europe, enjoying the pleasant shade of its numerous trees and its cool and refreshing fountains. InTextians work hard all year round and deserve a good rest. That’s why we have offered each of our employees a gift voucher for a holiday at Meteorite during the summer. To reconfirm our commitment as a reliable and experienced language services provider, InText Translation Company has become a Business member of ProZ.com. Every InTextians’ day is full of new challenges and hard work. So it is always great to have a few moments to relax and try some new teambuilding activities. This year, we didn’t want to make another clichéd gift, and we racked our brains for a long time before suddenly realizing that the best present had been right in front of our eyes all along. This year InText celebrates its 15th birthday! From the outset, InText undertook to make our industry better, and now, 15 years later, we are still committed to pursuing this goal. It has been a remarkable journey, full of challenges and risks, new achievements and awards. InText invited a business consultant to hold a training program. At the end of September we traditionally celebrate International Translation Day. This year, as is traditional, we gathered in our biggest room to congratulate our linguists. Read our article about UTICamp-2016 to learn more about the event, to find out its background and to feel its atmosphere. InText joined the MTC's 7th meeting which was held on September 8, 2017. InText is an organizer of the UTICamp-2016 conference and shares the videos of the speeches online. UTICamp was the first international translation conference held in the open air! Automated check of translated files is a standard QA procedure for any modern LSP. It helps to avoid serious errors which could not only lower the quality of the target files but also harm a translation companyпїЅs reputation. On June 10-12, 2016 we will attempt to accomplish the ambitious mission of combining a business event, prominent speakers and fascinating presentations about the art of translation and new technologies, with a camping adventure and a cordial reunion of old friends. The whole InText team wishes you Merry Christmas and incredible 2016 New Year! We were happy to accept the invitation from the organisers of the Moscow Translation Club New Year’s meeting. One of the most well-known and recognized scientific and design companies in the world celebrated its anniversary. Many of you follow the events that put Ukraine in the global news. On 21 November 2013, InText is going to participate in a UTIC-2013 Webinar "A Glimpse into the Future of Translation" hosted by Jost Zetsche. InText was chosen to provide interpreting services for the USPE European Police Championship in Swimming, which was held in Dnipropetrovsk in September. On 29 May, 2013 InText Translation Company attended the annual SAP Forum in Kiev, one of the largest events in the field of innovation technologies. We took a guided tour of Interpipe Steel, the recently launched electric steel mill complex, which is the first metallurgical plant built from scratch since Ukraine became independent. InText Forum was successfully held on Saturday, May 26, 2012. The event was hosted in the company's home city of Dnepropetrovsk, and it brought together in-house employees and the most dedicated freelancers that have been collaborating with us on a long-term basis. 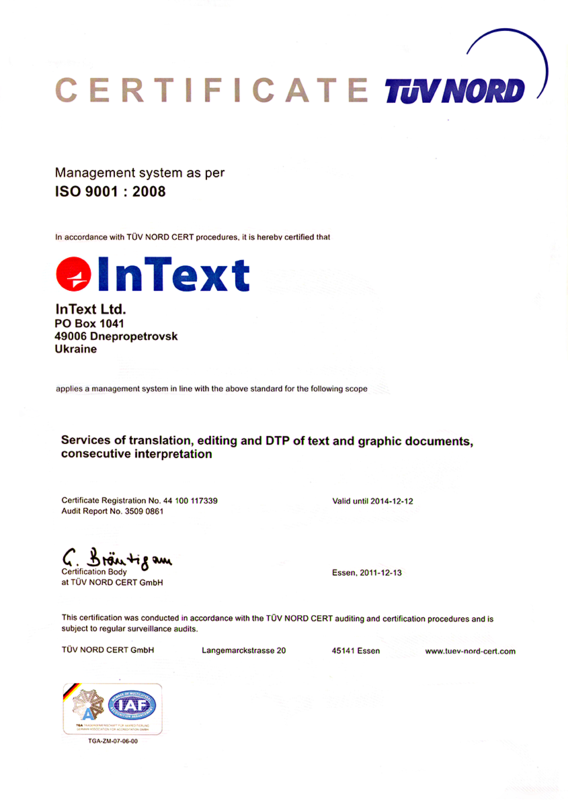 Early in May 2012 InText was registered by DIN Certco as being in compliance with EN 15038 Standards. Approved in 2006 by the European Committee for Standardization, EN 15038 aims to normalize and systematize procedures of the translation processes for delivering language services. Obtaining the notification of registration showcases the company's efforts to product high quality translations. From May 3rd to 5th, 2012, InText Translation Company attended Networking Days held in Madrid. The event was hosted by the European Language Industry Association (ELIA). It was the first ELIA event for us and the twelfth conference of the series. The the event was truly diverse and intense: new formats, interesting perspectives, fresh ideas, and top discussions. Back in November 2011, Russian translation companies participated in a project to reveal top 100 of Russian translation providers. The results published on December 23 showed that InText takes 11th place. As the end of the year approaches, we would like to look back on what this year have brought us and thank to all who helped us get wiser and stronger. Brainstorming Dec 2011 - a one-day, invitation-only unique event took place in Moscow on December 14, 2011, bringing together senior leaders of InText Translation Company, Neotech and All Correct Language Solutions. On October 31 InText Translation Company participated in the Travel Fair 2011, traditionally organized by the Alfred Nobel University to help its students and graduates realize their full career potential. InText Translation Company has once again become a partner and participant of Translation Forum Russia, an international conference with almost 500 participants from more than 15 countries. InText Translation Company has attended and sponsored ProZ.com Conference Ukraine 2011. The event was held in Kharkiv on September 17-18. The conference gathered members of ProZ.com, the world's largest community of translators. As always, education, communication and support were the main goals of the event. One of the largest conferences in Russia and the CIS welcomes translation and localization professionals from all over the world on September, 23-25. The event brought together the team of in-house employees and the most dedicated freelancers, that have been stably providing us with professional reliable services. GALA brought it all together once again: meeting of minds, value, innovation, and a refreshingly different experience. This time in Lisbon, Portugal. As usual, at the beginning of the year we were revising our plans, adjusting our targets, defining new areas of development and assigning priorities. Tekom conference and Trade Fair counted around 3,000 of participants and exhibitors, and more than 200 presentations and workshops. Merry Christmas and Happy 2011 Year! Our company has recently celebrated its 8th anniversary. On September 23-26, Yekaterinburg welcomed dozens of freelancers, in-house translators and interpreters working for large industrial companies, universities and translation companies in Russia and abroad for annual conference. GALA invited us to prepare a webinar based on the presentation 'High Quality Translations: Myth or Reality. An SLV's Perspective'. InText Translation Company welcomed Arturo Quintero, co-owner and chief corporate strategist at Moravia Worldwide. May 10-12, Czech Republic, GALA was holding a conference, where InText Translation Company made a special presentation. Despite the fact that we have been cooperating with AA Global for a long time, only this year we, finally, had an opportunity to welcome our established client. The year 2009 was a difficult year for InText, but our company proved to be able to focus on finding and implementing crucial solutions. Merry Christmas and Happy 2010 Year! At the end of October InText Company celebrated its 7th birthday. From the very beginning of the company's existence and until now InText has viewed continuous improvement of the team competence and exchange of knowledge and experience as its key tasks. It is with the deepest regret and sadness that we have to inform our partners, customers and friends that our Director, Yury A. Kalenyuk, lost his battle against cancer and died aged 73 on 18 July 2009. We believe that membership in this association will allow us to learn practical aspects of localization, receive timely "fresh" information about various events in the translation industry, its standards and rules, as well as to share experience, which, in its turn, will help us to improve the quality of provided services. InText Company and Oleg Rudavin, ProZ.com moderator for the CIS, held two seminars for the students of National Mining Academy and Dnepropetrovsk National University named after O. Gonchar. In 2008, the Company made yet another step forward in realization of its strategic plans. Let the coming year bring you a lot of interesting work, bright ideas, unforgettable experiences, reliable friends, partners and colleagues! May it bring you stability, prosperity, peace and joy! This year representatives of our Company attended the tekom annual exhibition and conference held in Wiesbaden. Last years saw creation of a stable basis for sustainable growth. Therefore, our current task is to use our accumulated potential. Regional conference organized by ProZ.com translators' website took place in Kharkiv. This is the first time such an event has been held in the translation market history of not only Ukraine, but also the other CIS countries. Representatives of our Company attended TM-Europe 2008 annual conference in Warsaw (Poland) organized by the Polish Association of Translation Agencies, which was held on October 9-10, 2008 in the Marriott Hotel. The theme of the conference was "Translation Management - Customers, Vendors and Processes Management Today". On May 24, 2008, All-Ukrainian public organization Association of Ukrainian Translators held its next workshop out of the set "Important Theoretical and Practical Issues of Translation". Our participation in GALA is one of the steps to learn the best practices of applying the global standards in the industry and particularly in the business processes of our company. We are happy to inform you that the representatives from our Company took part in one more conference which was held in Kharkiv. The Conference was dedicated to the urgent translation-related issues. InText Translation Company has implemented a new software product which is the powerful set of tools for data and document management, optimization of business processes efficiency and creation of secure interaction environment. The meeting of translators was held in Donetsk which was dedicated to the discussion of the most pressing problems which are the cause of the increased concern for our colleagues in European and CIS countries. Merry Christmas and Happy New Year to our customers and partners! On the eve of these wonderful holidays let us express our gratitude to the customers of our company! Your increasing demand for our services is a real incentive for improvement in all the aspects of our work. Thank you for your trust, understanding and support! InText Translation Company has launched its charitable activity. Our on-going challenge is striving for excellence. To this effect we are not only trying to find our own solutions, but also apply the best practice in our industry. We believe that participation in hands-on workshops and conferences is indispensable to learn the new methods of best practice. 5 years ago we started as a small translation agency, and our services then included mainly translation of personal documents with notary's attestation. Over these years of continuous growth our company has built a reputation of a reliable partner on international translation market offering the services of translation, reviewing, localization and DTP in many complex technical fields. Now we can perform jobs of almost any volume and complexity. We employ highly qualified linguists, technical and DTP specialists with a wide experience in their field who can meet the requirements of the most demanding customers. Our customer-oriented approach allows us to provide high quality services within the required deadlines. So, we already have a history of our achievements. We build on them in our daily work and are full of energy aspiring to new horizons. And with our devoted team we can have confidence in our future growth. Two new employees joined our team - a reviewer/translator from German and HR Manager. We are sure that their contribution to our common work will be invaluable. With an in-house expert in German we hope to improve the quality and speed up the delivery of our translations from that language. HR Manager will help with the search and selection of freelance translators for our supplier base. Recently we have upgraded our hardware and improved the use of network technologies. For that purpose we purchased a new powerful server and installed domain-based LAN in our offices, implemented centralized systems of antivirus protection and data back-up. This enabled us to enhance stability and security of our computer systems and speed up the operation of our database. All these steps are only a part of our extensive program of improving the customer service quality. Translation project in the field of oil&gas completed (appr. 400 thousand words). 5 translators, one editor, one project manager and a DTP specialist were involved in the project. The work on the project lasted for two months. All intructions and requirements of the client were met. Two experienced highly professional editors joined our Translation Company. According to our estimation, during the last quarter, our library increased by 50 new volumes, including the Russian-French Dictionary of Aerospace Terminology (A.Murashkevych, 2 vol. ), German-Russian Dictionary of Fuel and Oil (A.Chochia), Russian-Ukrainian Legal Dictionary (S.Vorobyov), Russia-Italian Business Dictionary (I.Zhdanov) etc.